When yet another person asked for the “purple carrots” at last Saturday’s farmers’ market, I realized they had moved up from alternative variety to mainstay status, alongside Nelson (hybrid) and Touchon (open-pollinated heirloom). That’s kinda cool, considering how orange and carrot go together around here. This is the second season that I’ve harvested PH for market at least every two or three weeks. This year, I’ve included PH in every carrot planting (five so far, one a make-up for bad germination), and despite one bad showing, germination is overall as reliable as any of the others. Once established, PH has been great in our rather heavy clay-loam soil, growing straight and performing well even when a bit crowded. Purple Haze is an imperator-shaped carrot (thick at the top, tapering to a point, cartoon carrot-style), with an orange core, and retains its purple color even through light cooking (it gets darker and less purple with full cooking). And it consistently tastes great—raw, it has a distinctively dry, refreshing crunch, and it’s always sweet as well as…carroty. It’s a hybrid (I intend to try Purple Dragon, which I’ve had my eye on for a while, apparently an heirloom, but the seed is crazy expensive…), grows to 10-12″ (25-30cm) in 65-70 days, was an AAS winner (best of the best new varieties) for 2006, the year it hit seed catalogs here. yeah you waste of space! 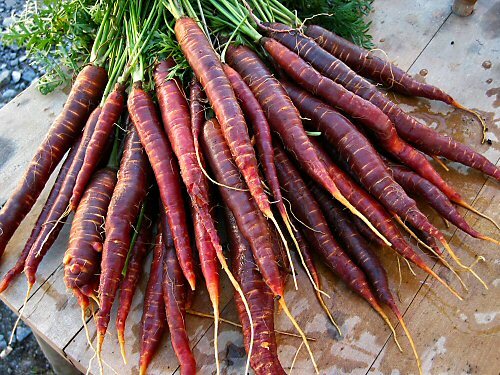 I kinda think they’re cool looking…one vote for purple carrots! Those carrots look wonderful! I was reading that carrots have only been bred in the traditional orange colour in very recent times. Most carrots historically have been white, yellow, purple, red.. I bet they taste good too. My carrots did not germinate this Spring, I have heavy London clay soil. I think I must add some sand to try again. “Kinda gross”?! ‘Gross’ is groping for your bag in the cinema and coming in contact with a used condom. I realize beauty is in the eye of the beholder but I’ll embrace variety and creative veggie expression over the supermarket status quo any day! Keep the multi-cultural rainbow growing, Mike! I remember when I first found out that ‘lettuce’ could mean more than iceberg lettuce. For nearly two decades of my life I thought that iceberg was lettuce, lettuce was iceberg. I have to say that I’ve enjoyed the diversity the previously unknown varieties of greens have added to my dinner plate. As a side note, I think that they look tasty. Rich in colour usually means rich in taste. Okay Mike, I’m raving about your photos all the time! Promise you’ll do an art book some winter when you have 5 minutes to not be digging in the dirt! Thanks for posting this photo. Just dreaming of what will come of my newly planted PH seeds. I just found these seeds last month online. You don’t find these in the market, not to mention even the seeds themselves in the garden stores. It makes me wonder also about health benefits — deeply colored veggies often contain antioxidants. I’ll have to look it up though. They look healthy and painfully gorgeous. i love, love, love! the ph carrot. it is definitely a sweet variety and they look so cool. i want to try and grow them next season. i live in a condo…so it will have to be a in a container, but i figure if i can get something deep enough, it might just work. thanks for sharing such a pretty image of your carrots. i can’t wait for next spring. It seems that purple carotts could be the next super food !!! i’m growing purple haze for the first time, the first purple haze carrot variety anyway, if you know what i mean ;) and i hope mine come out looking like that. I’m trying to grow some indoors, under led lights. Of course, its not like I’m known for my green thumb, so I don’t expect great results. Purple carrots though, why not give it a shot.